The American Humane Association conducted a 2 day workshop on Animal Emergency Services Volunteer Training at <?xml:namespace prefix = st1 ns = "urn:schemas-microsoft-com:office:smarttags" />McGee Park on October 4th & 5th from 8:30 a.m. to 5 p.m. This training was geared toward anyone interested in the welfare of animals following a disaster, including professionals trained in disaster response, Emergency medical Services personnel, firefighters, search and rescue personnel, animal shelter staff, Animal Control officers. 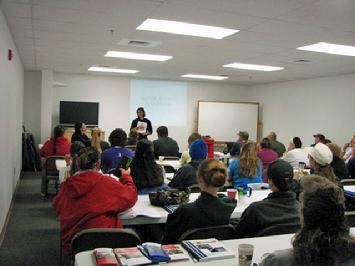 Topics included Animal First Aid, Personal Preparedness, small and large animal handling and more. There was a mock shelter set up and response session. 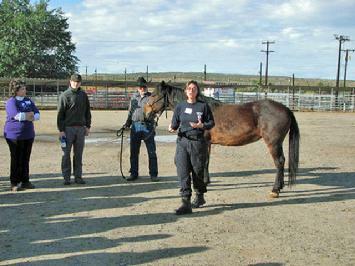 Four Corners Equine Rescue, in cooperation with Foundation for Protection of Animals and the San Juan County Sheriffs' Posse are hosted this event. It was a wonderful opportunity for everyone interested in helping animals during emergencies. Please follow this link to the AHA website - http://www.americanhumane.org/site/PageServer?pagename=ev_professionals_aes_training to find out when a training will be held in your area or to learn about hosting a training.